It’s been 5 years since Garnier released their Micellar Water that would forever erase my need to cross the border and stock up on the og Bioderma micellar cleansing water. 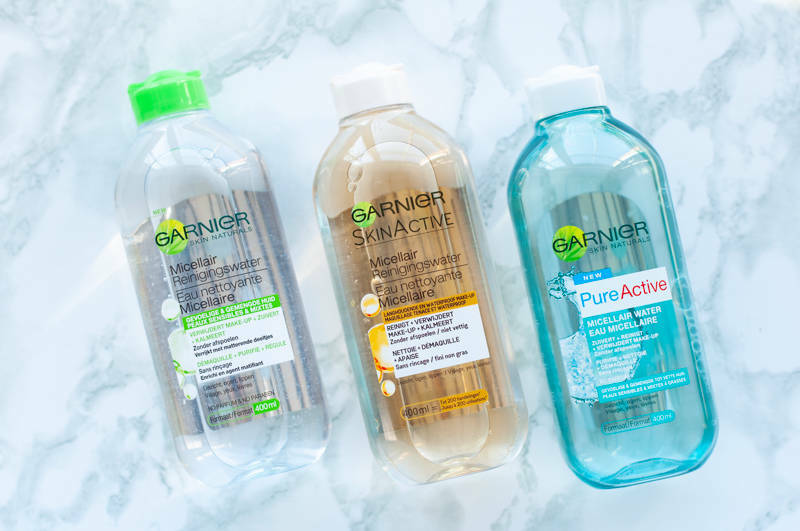 At a fraction of the price, this easy-to-get-ahold-of cleansing water from Garnier would forever change the makeup removing routine of many. 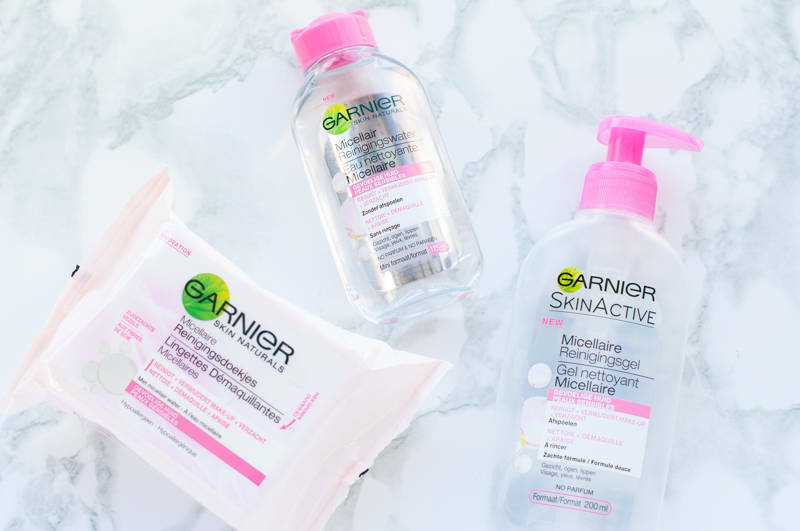 Let’s just start with some products that are directly linked to the original Garnier Micellar Water thanks to the similar pink packaging. 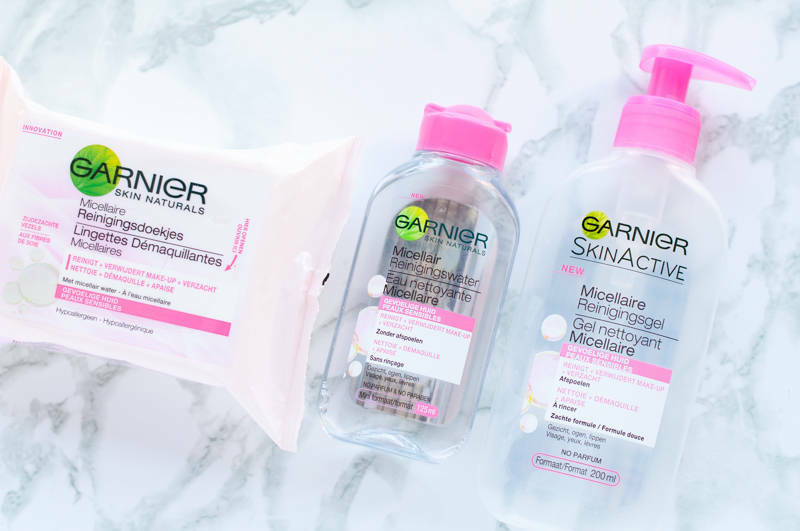 In the middle we have a mini version of the original Garnier Skin Naturals Micellar Water (pink) for sensitive skin – 100 ml € 3. Even though I’ve for the most part switched to cleansing oils and balms, I still buy the original from time to time because it’s just a very convenient product to have at hand. It’s very efficient and quick to remove makeup and grime from your face and this mini is just the perfect size to pack whenever I travel. Garnier Skin Naturals Micellar Cleansing Wipes – € 3,50 Garnier was one of the first brands to introduce micellar cleansing wipes to the drugstore. To this day I have yet to find one that I like. They’re all very irritating to my sensitive skin and this one unfortunately is no exception. I therefore only use cleansing wipes whenever I’m shooting swatches for my blog. Garnier SkinActive Micellar Cleansing Gel – 200 ml € 5, probably my least favourite out of the 3 pink Micellar products. Despite being very effective at removing makeup, this gel hurts like a m*** if you get it into your eyes. It is supposed to be safe to remove eye makeup but honestly, I recommend you not to get it anywhere near them. After my small expedition into the pink micellar range, I had a go at some of the other micellar waters too. You’re supposed to choose one according to your skin type, although I have found that it didn’t really matter as much. Garnier Skin Naturals Pure Active Micellar Water (blue) for sensitive, mixed to oily skin – 400 ml € 7 is probably the most harsh of them all. I have combo skin but wouldn’t put my skin through that again even if it was as oily as it used to be. In terms of effectiveness, I don’t really have the feeling there’s a lot of difference compared to the Garnier Skin Naturals Micellar Water (green) for sensitive & mixed skin – 400 ml € 7. If there’s one I’d recommend, it’s the Garnier SkinActive Micellar Cleansing Water in Oil (orange) for long wearing & waterproof makeup – 400 ml € 7. This one is the only version which has a layer of oil on top as you would typically find in eye makeup removers. This formula is still gentle enough for sensitive skin and effective enough to get rid of heavy and/or waterproof makeup. 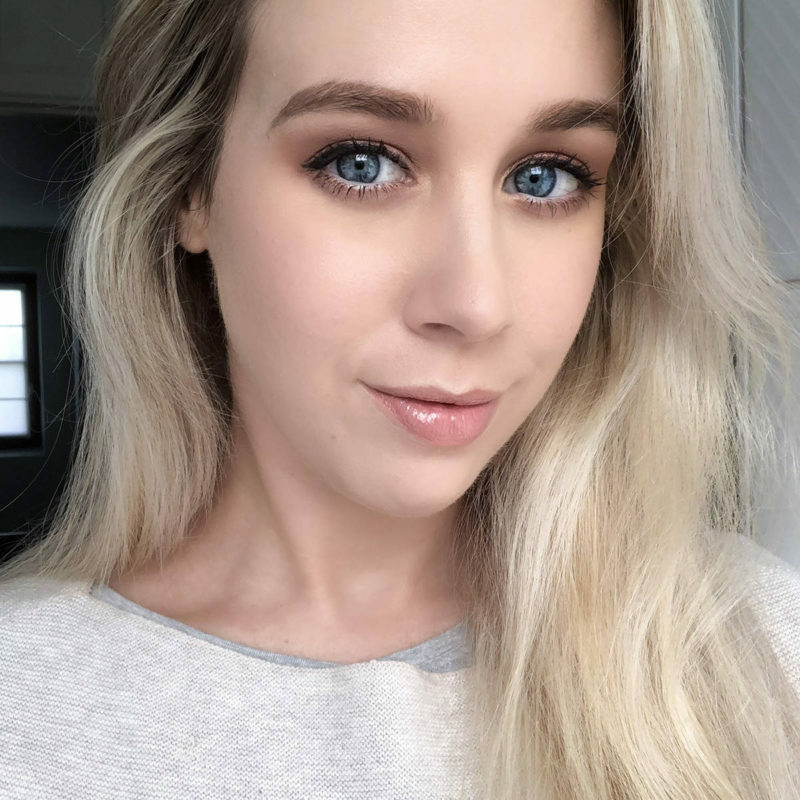 Overall, I still like to use the regular pink Garnier Micellar Water or switch to the orange Water in Oil bottle whenever I’m wearing more makeup than usual or waterproof mascara. Everything else is a pass for me. Garnier is available at the drugstore & supermarket.